The term used by early Buddhists to refer to what we know as “world” is, usually, the Pāli term loko. This word has more or less the same semantic extent of the French monde whose meaning is both «world» and «people» (consider, for instance, the compounds loka-visargaḥ, «distruction of the world» and loka-vikruṣṭaḥ, «offensive for the people»). The substantive loko derives from the Sanskrit root √lok, on which, on the one hand, the verb lokate («he sees», «he perceives»), and on the other hand, the verb lokayati («he knows») depend. The same meaning is conveyed by √loc, from which we have locate and locayati (again, respectively, «he sees», «he perceives», and «he knows»). However, this last verbal root expresses, even if as a secondary sense, a certain idea of brightness: on √loc, indeed, it depends for instance the adjective locanaḥ/-aṃ/-ā, translatable as «who/which illuminates», «illuminating». Now, on the basis of this consideration we can, with every right, remind another Sanskrit root semantically connected to √loc – and, therefore, to √lok –, that is, √ruc. From √ruc we have both the verb rocati, «he shines», «he is bright», and terms as rucaḥ/-aṃ/-ā («bright», «brilliant»), ruciḥ («light», «splendour»), and so on. Thus, in the light of this semantic relation existing among √lok, √loc and √ruc, the term loko inevitably recalls the idea of a space that is bright – i.e., a space that is, first of all, and by itself, evident – and, therefore, the idea of a region free from impediments, open to the possibility of being seen and known. 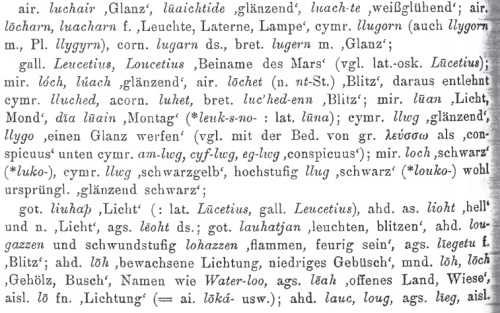 The corresponding Latin term is not, as one could suppose at a first glance, lŏcus («place», «region»), rather lūcus, whose meaning is «glade, clearing [of a wood]». As a philosophical note, we can remark that in the 20th century Heidegger made use of the term lichtung («clearing») to refer to the state in which the Dasein “sees” him/her/it-self appearing from the darkness of the forest (i.e., the previous condition of ignorance). 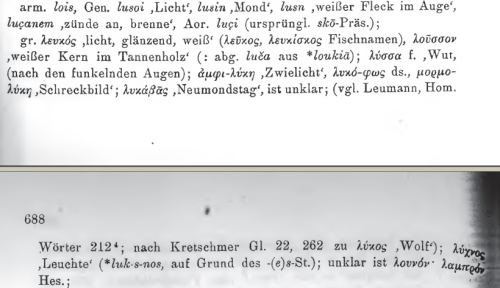 In Greek we have λευκός («white»), derived from an Indo-Aryan root √leuk, surely cognate to √lok. This argumentation leads us to consider that, philosophically, loko is not merely a condition for perception, rather it is a condition first of all favourable – because of its brightness – to the exercise of a perceptive-cognitive activity: the world, in its readiness towards knowledge, by its nature gives itself to a searching look. Through a look, which must be an aware one, the knowledge of the world reveals itself to the individual. Knowing by means of sight appears to be, philosophically, the principal mode by which the bright world, not concealable to perception, gives itself to man, but only to that man who is able to investigate it. It is meaningful, indeed, that the Pāli Canon makes use of such expressions as jānāti passati («he knows, he sees»), or jānaṃ passaṃ («knowing, seeing»), not only in reference to the knowledge derived from senses, but also to the understanding developed in concentration and meditation: the Buddha himself is described, in an apparently tautological way, as the one who knowing knows and seeing sees (MN I, 111: so h’āvuso Bhagavā jānaṃ jānāti passaṃ passati), where both knowledge and sight are to be comprehended not only as results of a perceptual activity, but also as referring to the deep truth of things gained by means of meditative practice.1 The term yathābhūtaṃ refers exactly to this condition of knowledge of things (bhūtaṃ) as they are (yathā). Now, when we take into consideration languages other than Sanskrit, for instance Tibetan and Chinese, we can notice a semantic shifting occurring on the term(s) meaning «world». It will be helpful here to refer to some reflections pointed out by Gadjin Nagao in one of his studies on Mādhyamaka philosophy. Nagao takes into consideration two passages of two different Kuiji’s (632-682 A.D.) works: the 法苑義林章, Fǎ yuàn yì lín zhāng, The Section of the Forest of Meanings in the Garden of Dharmaḥ (Taishō 1861), and the 成唯識論述記, Chéng wéishí lún shùjì, Commentary on the Treatise on Accomplishment of Pure Consciousness (Taishō 1830), which is, as it is well-known, a commentary on Xuanzang’s 成唯識論, Chéng wéishí lún, Treatise on Accomplishment of Pure Consciousness (Taishō 1586). There, the ideas of “convention,” “conventional” and “mundane” are discussed and Nagao, after having noted that these concepts have been expressed by Kuiji by means of the same couple of glyphs, affirms (Nagao 1989:43-44): «This explanation assigns two distinct meanings to the Chinese characters shih-su (世俗 [shì sú]) here translated as “worldly” and “convention.” It is difficult to ascertain today the precise etymologies of these Chinese words, but the original Sanskrit was certainly a single term, saṃvṛt(t)i, not a compound […]. Ch’i [Kuiji] further defines worldly as “that which can be destroyed.” […] “That which can be destroyed” seems to refer rather to the transient world that will finally be destroyed and nullified. Here Ch’i’s interpretation […] focuses on the Sanskrit term, loka, the equivalent of the Chinese term shih-chien (世間 [shì jiàn]), world. From a root word meaning “to see, know, illumine,” loka came to acquire the sense of “destruction, collapse” (witness the Tibetan translation of loka as ’jig-rten, the place of destruction)». In Chinese, we find both 世間 (shì jiàn) – the ideogram 世 (shì) meant the time of one generation (roughly 30 years), the ideogram (jiàn) means «breack», «fissure», etc., hence «interruprion» – and 世界 (shì jiè), literally meaning «border of 世», «limit of 世». 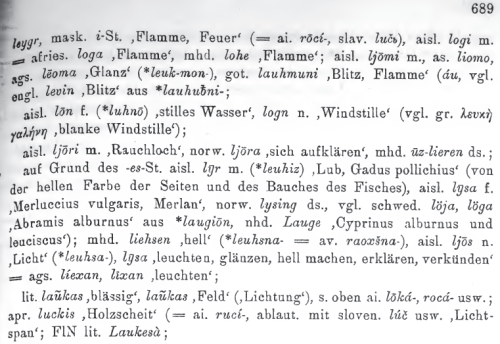 Nagao, then, underlines that (Ibid:147-148): «We are unable to pinpoint why and when the term loka was first understood as “destruction, collapse.” But, if we look at the dictionary entry, the root for the term loka meaning “to see, know, illumine,” is similar to the root for the term to destroy: luk, luñc, lup, lū, which can all mean “to destroy.” We also find terms such as luṭh, luḍ, luṇṭh, lubh, meaning “to shake, to confuse.” […] In the Mahāvyutpatti, 3061, we find lujyata iti lokaḥ, ’jig–pas–na ’jig–rten, that is, “it is the world because it is destroyed”». Of the Tibetan ’jig-rten, Chandra Das (1991:455-457) specifies two meanings: the one is «saṃsāra, the transmigratory existence», and the other «martyalokaḥ, receptacle of all that is perishable». According to Tibetan and to Chinese, then, lokaḥ is not intended as the place in which a bright knowledge can happen, rather it seems to be something which leads us to destruction, and then to the elimination of every possibility of knowledge. (1) On this subject see Jayatilleke (1998:419): «[…] there is good reason to believe that when Buddhism used the expression “knowing and seeing” (jānaṃ passaṃ), it meant by it the direct knowledge gained by sense perception […]»; (Ibid:418): «In the Nikāyas it is said that the Buddha is a jñāna-vādin or a jñānin. He is described as one who “knowing, knows and seeing, sees having become sight and knowledge” (jānaṃ jānāti passaṃ passati cakkhubhūto ñāṇabhūto, M[N] I, 111). “The knowing and seeing One” (jānatā passatā, M[N] II, 111) is a characteristic description of the Buddha and it is usually said of what he claims to know that he both “knows and sees” (tam ahaṃ jānāmi passāmī ti, M[N] I, 329). – Nagao, G., The Foundational Standpoint of Mādhyamaka Philosophy, Sri Satguru Publications, Delhi 1989. There are few English cognates. ‘Lea’ meaning a meadow is one. Probably the ‘loo’ in Waterloo is also. Many thanks for the bibliographcal indication, to which I would add also the brief: Gonda, J. “An Interesting Use of Skt. loka”, Indo-Iranian Journal 15 (1973), p. 205, as a little integration of his book. 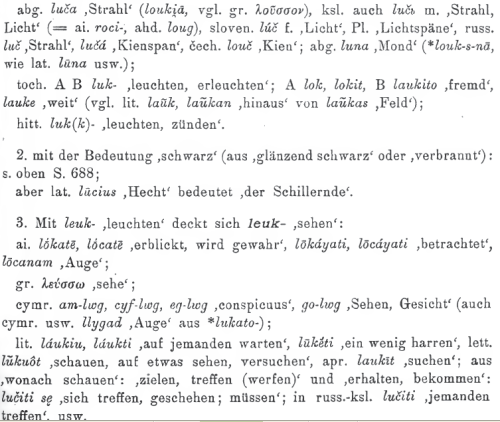 Thanks also for the link to Pokorny’s Wörterbuch, that I didn’t know! !